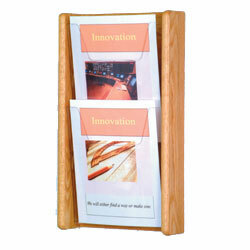 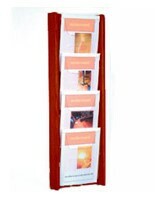 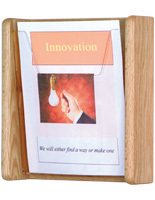 These 2-pocket wall mount literature racks are wooden magazine holders that have a tiered design to save space. The light oak displays are ideal for hanging in reception areas, next to exam rooms, or in a showroom. 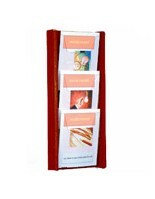 The literature racks with 9.5” wide pockets are able to hold various periodicals and other sheets of paper. 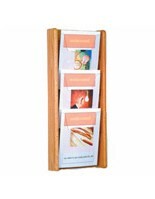 The wooden magazine holders have solid sides and backing with a tall acrylic front on each slot to keep catalogs from bowing over and becoming bent. 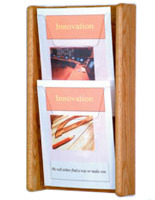 The racks have a light oak finish that easily accommodates many different styles of decoration. 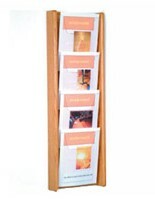 The hardware needed for hanging the displays is included with purchase.